15" Powered Speaker Enclosure With Horn. Two-way 800 watt peak power enclosure. RX™ 14 titanium compression driver. LED signal present and DDT active indicator. Combination 1/4" and XLR input. Exclusive DDT™ compression and speaker protection. XLR and 1/4" through outputs. 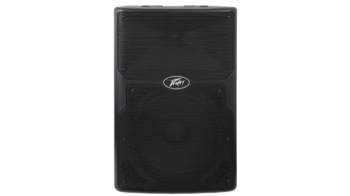 15" high-performance Peavey woofer with 2.3" voice spindle. Angled side for use as monitor when required. Weight Unpacked: 52.00 lb(23.587 kg). Weight Packed: 58.00 lb(26.308 kg). Width Packed: 21.625"(54.9275 cm). Height Packed: 31.625"(80.3275 cm). Depth Packed: 20.375"(51.7525 cM).